startPosition The start point of the bezier line. endPosition The end point of the bezier line. startTangent The start tangent of the bezier line. endTangent The end tangent of the bezier line. color The color to use for the bezier line. texture The texture to use for drawing the bezier line. width The width of the bezier line. Draw textured bezier line through start and end points with the given tangents. To get an anti-aliased effect use a texture that is 1x2 pixels with one transparent white pixel and one opaque white pixel. The bezier curve will be swept using this texture. 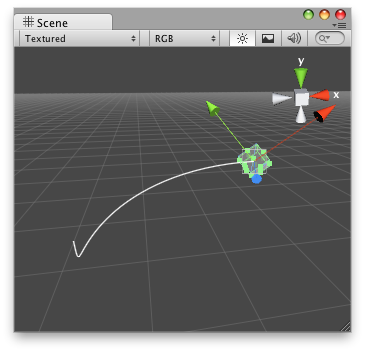 Bezier Line in the Scene View.